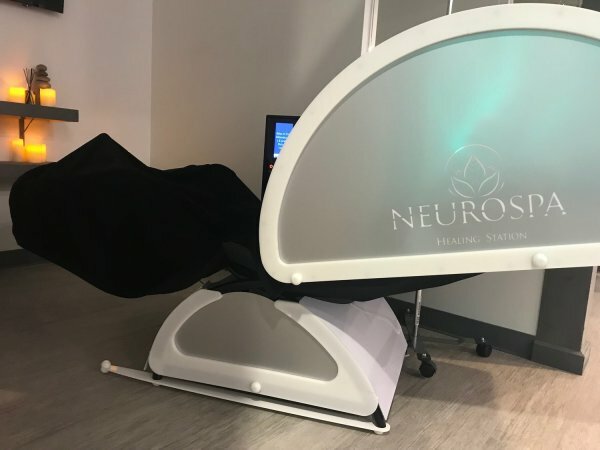 NeuroSpa Energy Lounge: The NeuroSpa Energizing Lounge helps achieve a state of well-being by releasing tension at a deeper level of the body. Our Energizing Lounge is a unique kind of relaxation therapy that synchronizes your mind and body through the power of sound, light and massage. NeuroSpa is offered in more than 300 renowned spas. Well-known companies (e.g. : Google,Reebok, Ubisoft) offer it to their employees to relieve pain, reduce stress and improve performance. These relaxation devices have been designed to achieve mental wellness, relieve pain, reduce stress, and induce a relaxation state using multi-frequency acoustic vibration. During a session; the customer will sit comfortably and select an energizing or a napping mode, then soft sensations captivates the customer from the first minutes and stimulate gently all parts of the body. After a short time, the acoustic frequency neutralizes resistance and communicates directly with the nervous system which gradually replaces tensions caused by stress. The comforting sensations fill the entire body, leaving the customer in a state of peaceful tranquility. It's a revitalizing experience that helps the customer be centered in the moment and gives a continuous warm feeling during normal daily activity. The NeuroSpa allows achieve temporary state of wellness and improve body energy in few minutes (15-30 min.) and regular sessions allow permanent mental and physical balance. The NeuroSpa is used in most renamed spa centers, because it helps achieve a real state of wellness by releasing tension at a deep level of the body. Positive effects are similar to osteopathy and full body massage therapy techniques. It is why many health professionals use these devices in combination with traditional treatments. NeuroSpa Health Benefits: neutralizes stress and anxiety; improve sleep and eliminate fatigue; improve performance and concentration; deeply relaxes the body; provides durable sense of well-being; stimulate blood circulation; regulate blood pressure; relieves chronic pain; reduction of back and neck pain; and reduction of arthritis pain. The NeuroSpa Energizing Lounge helps achieve a state of well-being by releasing tension at a deeper level of the body. Our Energizing Lounge is a unique kind of relaxation therapy that synchronizes your mind and body through the power of sound, light and massage. NeuroSpa is offered in more than 300 renowned spas. Well known companies (e.g. : Google,Reebok, Ubisoft) offer it to their employees to relieve pain, reduce stress and improve performance. Energy Wellness Partners' Energizing Stations utilize a patented worldwide technology developed in Quebec, Canada. 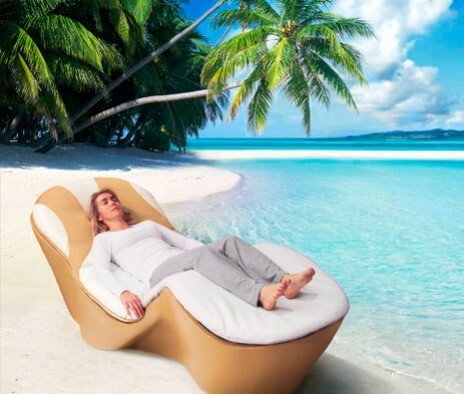 These relaxation devices have been designed to achieve mental wellness, relieve pain, reduce stress, and induce a relaxation state using multi-frequency acoustic vibration. During a session; You sit comfortably and select an energizing or a napping mode, then soft sensations captivates you from the first minutes and stimulate gently all part of your body. After a short time, the acoustic frequency neutralize resistance and communicates directly with the nervous system which gradually replaces tensions caused by stress. The comforting sensations fills your whole body, leaving you in a state of peaceful tranquility. It's a revitalizing experience that helps you be centered in the moment and give you a continuous warm feeling during normal daily activity. The NeuroSpa allows achieve temporary state of wellness and improve body energy in few minutes (15-30 min.) and regular sessions allow permanent mental and physical balance. The NeuroSpa is used in most renamed spa centers, because it helps achieve a real state of wellness by releasing tension at a deep level of the body. Positives effects are similar to osteopathy and full body massage therapy techniques... It is why many health professionals use our devices in combination with traditional treatments. 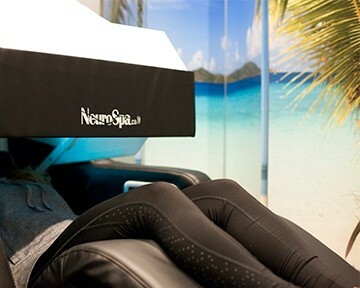 The NeuroSpa is developed in Canada (Quebec) and is patented in Asia, Europe, Australia and the United-States. Patented worldwide, the NeuroSpa is the premier therapeutic relaxation device allowing to reach a complete state of well-being. 1. Check-in with the Energy Wellness Consultant to fill out your information. Upon arrival, you may complete your waiver. 3. You stay completely dressed. Feel free to remove shoes if you’d like. 4. Once you start your session, sit back and relax, the chair will recline back, the hood will extend forward and your session will begin. 5. Once the session ends, the hood will open, the chair will recline forward and you can exit the Lounge room feeling calm, refreshed and relaxed.